30' Surveyor QBS - K-Jack RV Rentals- Parksville, Qualicum Beach, Vancouver Island B.C. Our 30' Surveyor Quad Bunk Model is a great new fit to our fleet of RV trailers.There is lots of room for the whole family. This unit has a private walk around front queen bedroom with sliding doors, couch/bed, dinette/bed, and the kids' quad bunk room has a bench dinette/bed. 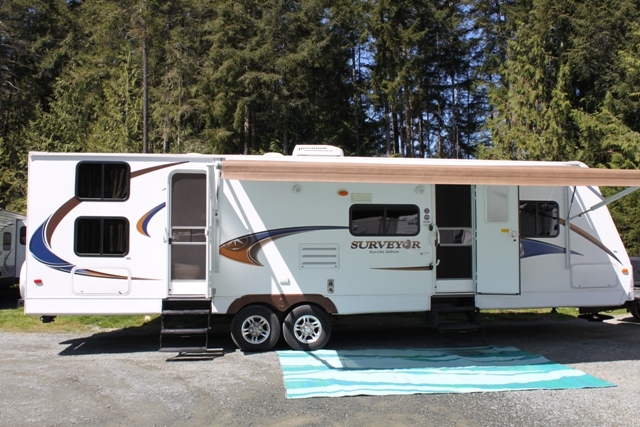 This family sized RV with a large slide is equipped with A/C, electric awning, T/V, DVD/Stereo, solar panel and heated tanks for the off sesaon camping. 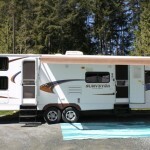 This spacious RV has a full bathroom, microwave, three burner stove, oven and lots of storage. Sleeps 6-8, full bathroom, fully stocked kitchen, fridge, 3- burner stove, oven, microwave, double sink, outdoor mat, exterior shower.